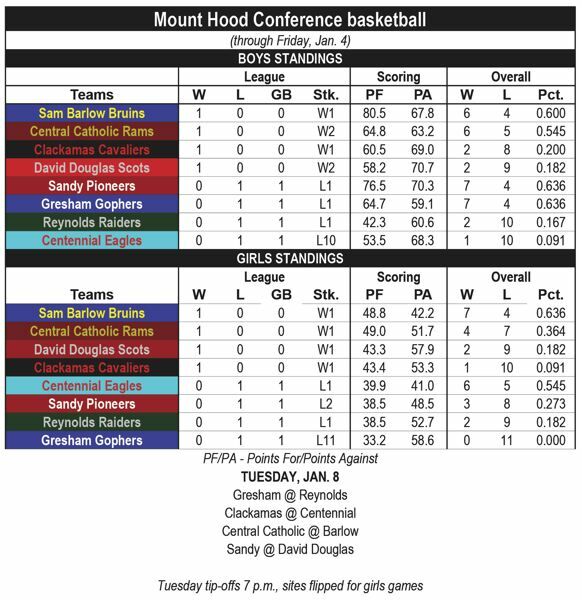 PORTLAND — The Central Catholic boys basketball team got the Mount Hood Conference season started on the right foot with a 76-54 home win over Gresham on Friday night. The Rams put Gresham into chase mode from the opening tip with Isaiah Amato slipping behind the backboard and coming out the other side for a reverse layup. He then sprinted down to the defensive end and blocked a shot. Central got the ball back, and Amato was fouled on a 3-point try. He made only 1 of 3 at the line, but the Rams were out to a quick 15-9 lead. Gresham made its biggest splash when Sam Igbonagwam attacked the rim and was fouled on his way to attempt a dunk early in the second quarter. He sank both free throws to pull the Gophers to within 10 points, but that was as close as they would get. Igbonagwam finished with a team-high 18 points — 12 of them coming in the fourth quarter. Amato finished the first half with another scoring spurt, knocking down a 3 then swiping an inbounds pass under his own basket for another quick two. He beat the halftime horn with a step-back jumper from the elbow to send Central to the locker room in charge 40-21. Gresham (54) — Sam Igbonagwam 18, Eric Puclik 11, Daello Portin-Chapman 8, Ethan Abrahamson 7, Syrus Sagiao 4, Andy Herrejon 4, Isaac Clinton 2, Mardini, Butler, Henkle, Welch, Lively. 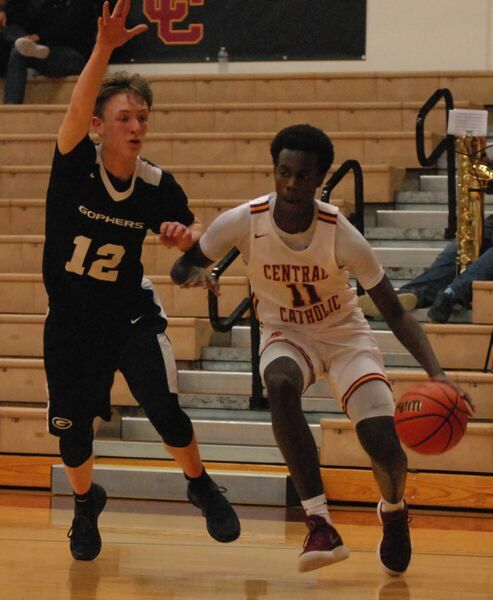 Central Catholic (76) — Isaiah Amato 18, Darius Gakwasi 16, Tyson Parker 12, SataieVior Ayilola 10, DeRay Seamster 9, ordan King 5, Gaige Ainslie 2, Luke Johnson 2, Kevin James 1, Khalen Bostic 1, Gold, Slater. DAVID DOUGLAS 58, REYNOLDS 52 — The Scots got off to a fast start with Jediah Dorn coming off the bench and hitting five buckets in the first quarter, including a three-point play. Trenton Templeton hit a pair of early 3-pointers to give David Douglas a nine-point lead into the fourth quarter. Dakota Lohmeier went 5-for-6 (.833) at the free-throw line and added nine points. Sterling Bell led the Raiders with 14 points, while Keenan Coleman knocked down a trio of 3-pointers. 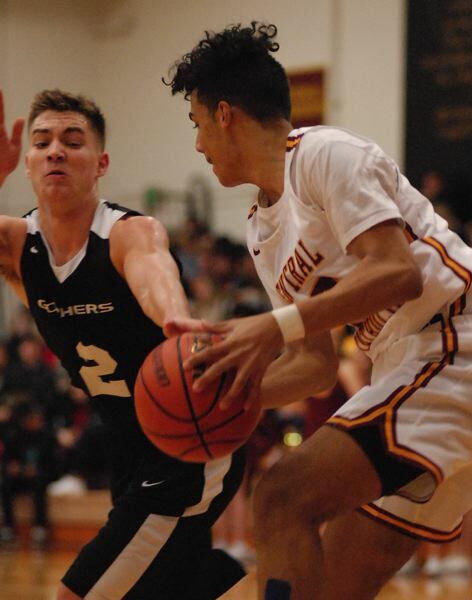 The win marked the second straight for the Scots, who were coming off a 65-61 win over McMinnville to wrap up the preseason a few days before New Year's. David Douglas (58) — Jediah Dorn 14, Trenton Templeton 13, Dakota Lohmeier 9, Kevin Rodirguez-Nava 9, Jermaine Robinson 7, Naatoli Mohammed 4, Geo Baxter 2, Frasquillo, Chavez. Reynolds (52) — Sterling Bell 14, Keenan Coleman 12, Matthew DeLeon 9, Cam Mager 8, Kehdon Fletcher 5, Jamarkus Taylor 4, Stewart, Martinez. BARLOW 102, CENTENNIAL 52 — Evan Inglesby dropped five first-quarter buckets to put the Bruins up 27-12 for a lead they would never relinquish. Jesse White picked up the scoring with 17 of his game-high 29 points coming in the second quarter. Barlow put 12 players into the scoring column with Kyree Thames hitting a trio of late 3-pointers to push the Bruins over the century mark for the second time this season. Barlow (102) — Jesse White 29, Evan Inglesby 14, Dominic Jacoby 12, Kyree Thames 9, Joey Wolcott 8, Noah Lowery 5, Wilson Weber 5, Nathaniel Koenig 3, Jaren Hunter 3, Charles Ndayizeye 2, Josh Nomie 1, Jones. Centennial (52) — Nate Caro 14, Jimmie Barton 13, Tommy Anderson 10, Travis Johnson 7, Andrew Caron 5, Jonah Walter 2, Collin Estep 1, Calvert. 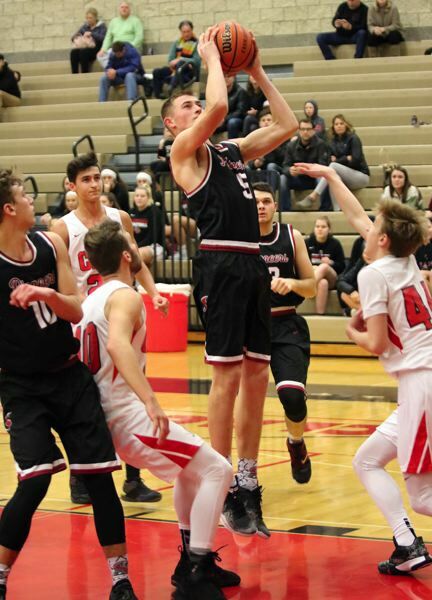 CLACKAMAS 77, SANDY 63 — Clackamas didn't exactly light it up to start the game. In 15 first-quarter possessions, the Cavaliers went 5 for 16 from the field and 1 for 4 from the free-throw line with no turnovers, which wasn't great, but it was good enough to keep them three steps ahead of Sandy. Clackamas extended to a 30-10 lead midway through the second quarter when Jailen Hammer came up with the ball off a Sandy turnover, got fouled on the way to the basket, and made both free throws.